Since our footballing travels take us to a range or weird and wonderful places following the Whitecaps at all the various levels and watching the local soccer scene, we started a “Groundhopping” feature last year to take a look at some of the more characteristic football stadia that we end up watching from in the US and Canada. We kicked the feature off with a trip to Cheney Stadium in Tacoma when the Caps U23s played there against Seattle in PDL action. Despite our best intentions, we never continued the series, but we’re going to make amends for that with the first of three new stadiums we took in on a recent vacation. Again it was to watch the Caps play the Sounders in PDL action but this time we were east of Tacoma, in Sumner’s Sunset Stadium. As someone whose life has always revolved around football, vacation time can never be booked until I see the new season’s fixture list. Only then can things start to take shape so I don’t miss any of my team’s home games. This year my wife is having to go solo to two weddings in August because they clash with the Caps at BC Place. It’s a great excuse not to go and she knows I wouldn’t have gone anyway! What makes my long suffering wife so accepting of this obsession is the fact that she knows that in amongst all of the craziness and peaceful times she gets at home when I’m out watching some Provincial Cup or SFU game, she gets to go on a few great road trips over the year. Once the MLS schedule is out, Seattle and Portland away games are the first ones to look at, as that signals our family trips down the Oregon coast with our equally happy beach loving dog. Next stop is the PDL schedule, crossing fingers that there will be some away games I can go and cheer the U23s on in during one of the trips. Sometimes the fixture gods are smiling and throw up a monumental road trip. This year was one of their happy years. Last Saturday’s game at the Clink came at the end of our most recent trip, enabling me to take in three games in three days. It would have been four if NBC hadn’t changed the kick off time for the MLS Caps, meaning I would miss the U23s play at Kitsap that night. I was probably one of the few people really disappointed by the prime time scheduling! I did get to see the U23s play away the night before at North Sound and on the way up the road on Sunday, I finally got to take in a Bellingham United game in the Pacific Coast Soccer League. Those stadiums will be the focus of our next two “Groundhopping” features. 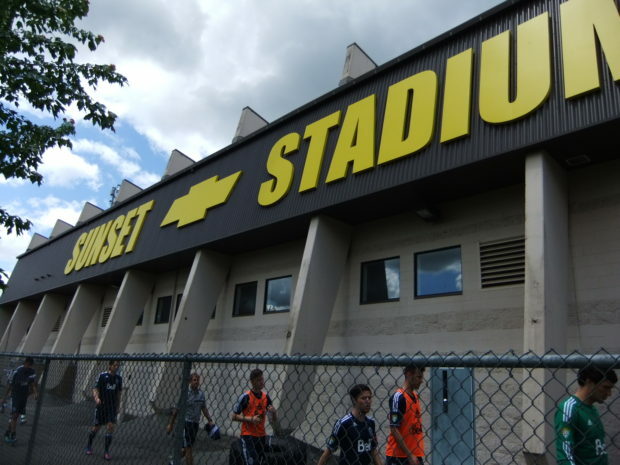 Our trip started the week before though, when we packed up and headed south to Oregon but with a special stop on the way in Sumner to see the Whitecaps U23s take on Seattle Sounders U23s in PDL action. I like to think I have a fairly good grasp of geography when it comes to the western USA. I know some places in the east and the middle is kind of a blur, but when it comes to Washington, Oregon and California, my many travels over the last few years have taken me to many wonderful places and I’ve got to know a lot of those states and some of the others around them. I had never heard of Sumner, Washington though until the 2013 PDL schedule was released! Sumner is a historic small town of around 9,500 people, about 12 miles east of Tacoma, which was founded in 1883. Like many such places in North America, it’s now a mixture of the historic old town, with heritage buildings, modern days housing, and the new retail giants like McDonalds, Starbucks and Fred Meyer, all of whom surround the town’s Sunset Stadium, which played host to this particular PDL match. The stadium, Sunset Chevrolet Stadium to give it it’s full sponsored name, is primarily the home of Sumner High School’s sports teams – the Spartans. Soccer, American football and a host of other sports are played on the much utilised, multi purpose, field turf pitch, which of course means it has more lines than a completed wordsearch puzzle. It may have taken me nearly six years, and undoubtedly I’ve been helped by watching so many games at SFU and UBC recently, but my tired old eyes may just finally be getting used to which bloody lines to watch the game within. Sunset Stadium is your typical high school or collegiate stadium really. It has an eight lane, 400m championship sized athletics track around it and no seating, or much of anything else really, behind either goal. The stadium was first opened in 1959 and received a $1.7 million remodelling in 2001 and 2002. The result is an excellent, multi sport facility that offers a 362 foot by 216 foot artificial grass, in-fill turf field, which includes markings for a 116 yard by 70 yard soccer pitch. There are two covered grandstands, which provide combined seating for 3300 people. Both are just your usual cold, steel bleacher style benches. The larger of the two, referred to as the ‘home’ stand, is situated on the south side of the stadium. It seats 2400 and houses a press box along with two lockers rooms underneath it, concessions and toilets. The locker rooms can’t seem to be accessed by going up a tunnel in the stand like you’d expect, so instead the players have to all troop off round the side then walk around the back of the stand to get in and out. The ‘visitors’ stand seats 900 and also contains concessions and toilets. It’s a picturesque setting and as you sit in the main stand, especially up the back of it, you are afforded some wonderful woodland views of the surrounding area. There is nothing of note in the east part of the stadium apart from the view, with the area behind the east goal being just athletics track right up to the exterior fence. Although there is nothing directly behind the western goal either, several feet further back there is the stadium’s scoreboard, along with office space, meeting rooms, a classroom and a dressing room for the officials of the day. The main entry is to the east of the main grandstand, where there is a ticket booth. There is also a large car park outside to the south of the main stand. For busy games, the north stand also has ticket booths. There is also a nice memorial plaque on the south stand for the groundskeeper of 21 years Terry Biller. 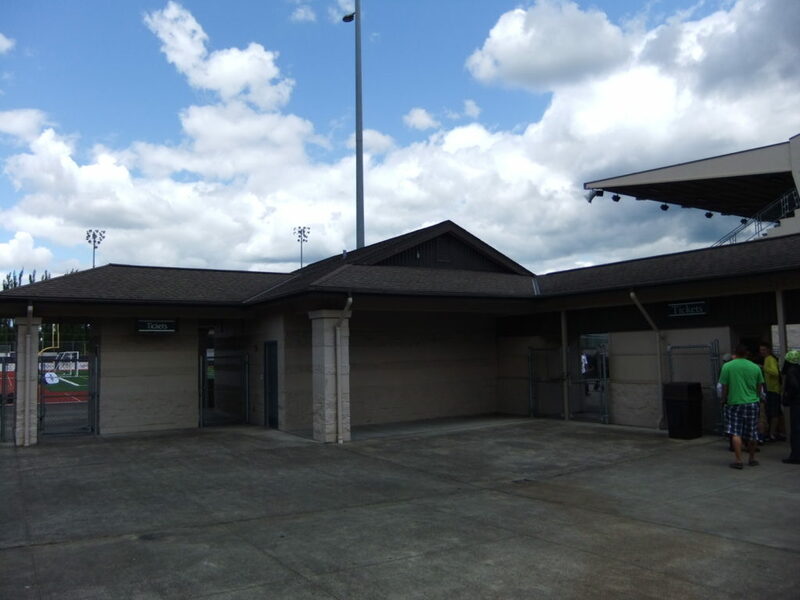 The stadium provides the best sporting facilities in Pierce County and serves as a playoff site for league, district, and state high school playoffs in football, soccer and track and plays host to the Tacoma United spring soccer league amongst other things. When Seattle Sounders U23s rebranded Tacoma Tide last season, they seemed to have taken the remit of getting the Sounders brand out to as much of Washington state as they could reasonably do. Last season they played their eight home PDL games at three different venues around the Tacoma area. 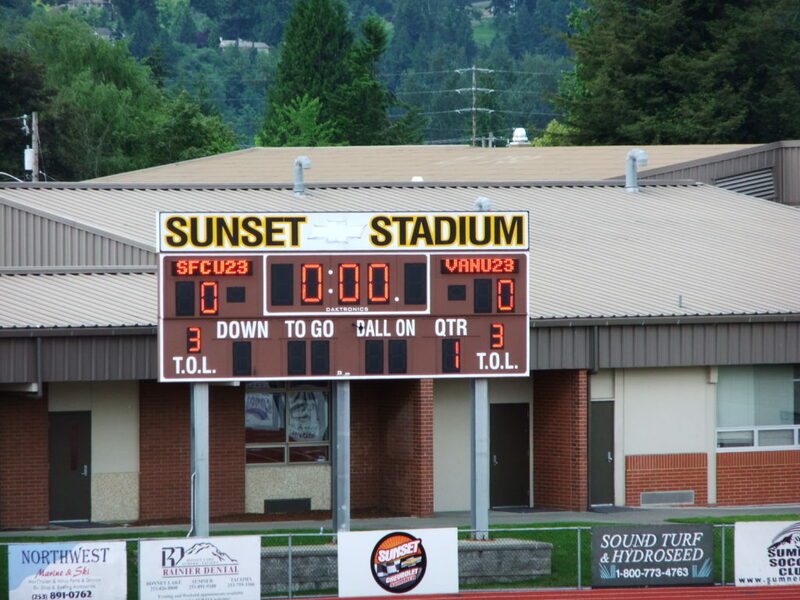 They also played a pre-season friendly against Gonzaga University at Sunset Stadium in Sumner. This season’s seven home games will see them play at four different venues (all of which are different to last year’s three) and have looked at double header games with the Sounders women. Whilst I fully understand the business plan behind making the Sounders all of Washington’s team, the constant moving around of the matches does prevent building up a large, regular fanbase and the result has been low crowds for many of the matches, but the odd ones have drawn some good numbers. 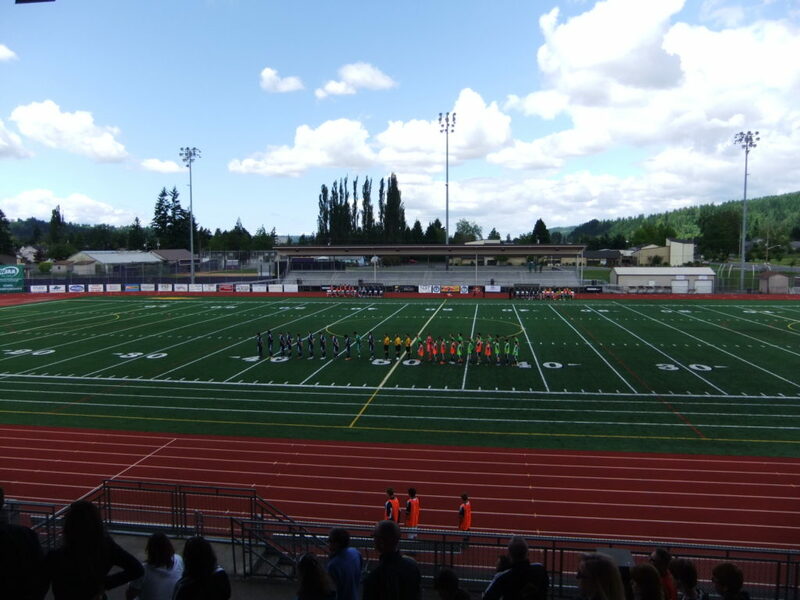 Of the four venues, Sunset Stadium will play host to three games this season and they also hosted the team’s first round US Open Cup game against Doxa Italia in May. The game against the Whitecaps was the first one of the three league games to be played in Sumner and on a blisteringly hot and sunny day, it didn’t really seem to be the main draw in what seemed in general to be a really quiet town. The official attendance was 173, with the majority of that number seemingly made up from players’ family and friends. You have to imagine they’d be getting a lot more if the games weren’t in the middle of nowhere and back up at Starfire (where they drew 1311 for their previous game two days earlier, albeit one of the double headers). There were three ECS guys there and they tried their best at the start to chant and sing but soon gave up apart from the odd burst into song. Speaking to one of them at half time, they confirmed the same problem that we have in Vancouver – getting people out to watch these games. They try and get to their fellow fans to realise the importance and the joy that can be had in watching all levels of their club and seeing the future come through the ranks. Kudos to them. As for the game itself, well it was one best forgotten about really if you’re a Caps fan. Seattle won 1-0, grabbing the only goal of the game when Luis Esteves pounced on a horrible sliced clearance attempt across goal from Caps MLS loanee Aminu Abdallah and had the easy job of knocking home the only goal of the game from close range. The Caps tried a late rally but couldn’t find a way through and left empty handed, something which the MLS team know a lot about in these Cascadian derbies. 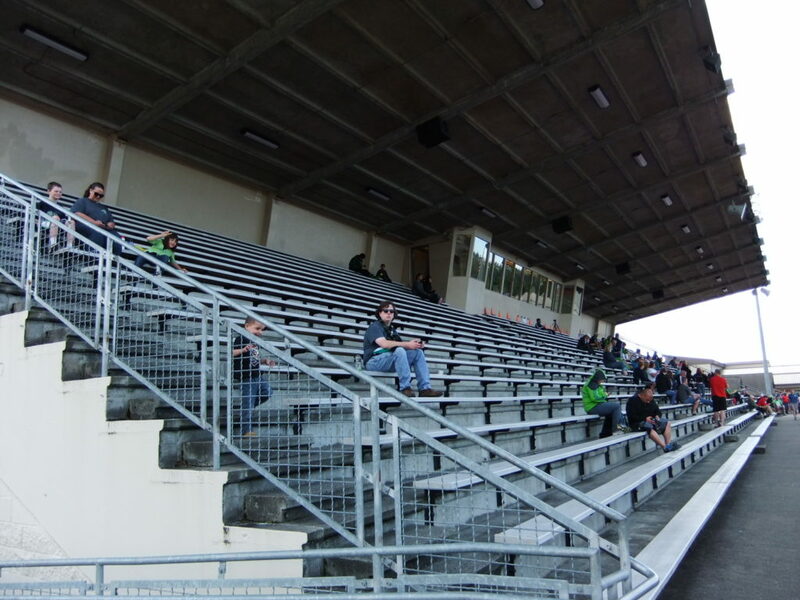 Despite the low crowd, the Sounders put on a really professional feel for their PDL matches, as I noticed at last year’s game. There’s the usual photocopied team sheet, but they also have the players signing autographs after the game and there’s also an official post game meet and greet/dinner with the players thing at a local sponsor that is a pizzeria. It was a fun afternoon out, despite the result and the general quality of football on display on this particular day. It’s always nice to visit a new stadium, but this match made it three away PDL games in the US and not one win seen yet. It was starting to be like the first team. Thankfully that was all to change with my next trip, although North Sound made the Caps work hard to make that happen. But more of that next time in “Groundhopping”.